Seller: ScanBiz Mobile Solutions L.P.
© ScanBiz Mobile Solutions L.P.
Great app and great price! I always hated collecting business cards. I would throw them away but now with this app I can save them and share them. One big suggestion, please work the excel export option to include the picture of the cards. Thanks! Makes simple mistakes. Not including @ sign in e-mail address. Transposing letter like “i” into “l”. Always need to make corrections even on basic bus cards that are very readable. I paid because it said it could export to salesforce. Because my salesforce has required fields to save contact info such as a sale type it will not let me export. The app does an ok job of deciphering the info on a card and putting it into the correct places I’d say about 60%. I don’t mind editing it a little, but I’m not sure it saves me any time. Pretty much useless to me if I can’t export to salesforce. I think maybe I’d just prefer a photo Rolodex. I have an iPhone X with an amazing camera and even on the simplest of business cards this app always scans something wrong so I have to read through what it puts down to make sure I catch the errors—it’d be just as fast to input it all myself most of the time. This is a great app that is easy to use and it has a very good OCR engine and user interface. So far all the cards I’ve scanned have had to be edited after transcription. Email contacts capture is Awesome!! The way it creates contacts from email is way better than my iOS suggestion. It is easy to review and add to address book. Save me tons of time!!! I thought the paid version would be worth it not only for removing ads, but also for a slick performance and interface. Turns out, the scanner does NOT automatically crop or enhance the photo. And, the accuracy of the text recognition was a little worse than the popular free app out there. While there may be another advantage I missed, I didn’t stick around to find out. This app does what I needed. Thanks. I have to make corrections to every card I scan. So what’s the point? Not a time saver. It should be better. Unreliable unless you proofread every scan. If you are looking for a fast solution to scan a lot of cards or you’re in a hurry, this isn’t the answer for you. I often have to do a lot of self-corrections. Takes a lot of additional time. Application is pretty easy to use, but takes some extra time having to fix info. I often will just delete it out and keep the cards scanned at least. Like the idea, but needs some work. Use this to take/scan/organize all the cards that I need to carry at work that used to clutter my wallet. I bought this app and tried a free app. 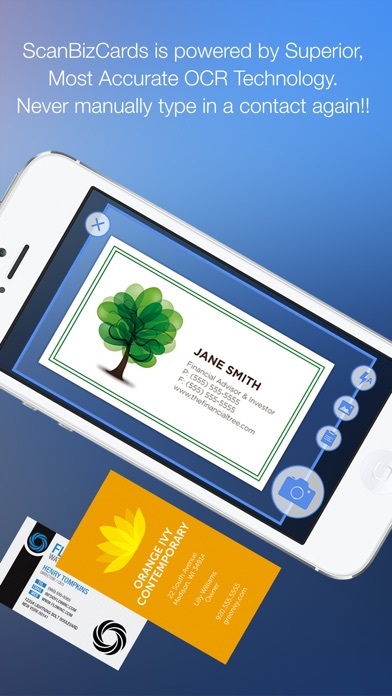 The Free App (not Scanbizcards) Would automatially outline the Business Card. This one you have to manually crop it then fix all the errors from the scanning. Wait of money buying this one. It is missing lots of phone numbers on the scan. I keep re scanning to make sure, but it is having difficulty with some cards. Every single card it scans has an error. I have to manually adjust everyone. Really disappointing, especially since I had to pay for app. I’ve been using this app for several years. Recently I had a problem accessing a backup due to migrating to a new phone. I sent one email asking for help and they replied quickly. Not only did this resolve my issue, but they checked back to make sure all was well. If I had to choose between an excellent app with mediocre customer care or a mediocre app with excellent customer care, I’d choose the latter. But in this case, both are excellent. I seem to gravitate to just a few characteristics when evaluating Apps of any kind: ease of download and setup, intuitiveness, ease of integration with other Apps, plainly stated directions (DEVELOPMENT TIP for APP developers-check your spelling, grammar, and properly formatted sentences),--this is not meant as a criticism of Apps from other countries; but if your description and directions are not written in plain English you may as well just watch movies rather than waste your and your customers time. BIZ CARDS meets all of these criteria. Love its ease of use, despite being a relatively complex program with tremendous and straightforward integration with other APPS and the iPhone programming. Congratulations on a great piece of work. Does what I need but I wish it would transcribe a bit better. Sometimes I don’t have to correct anything but most often I’m correcting up to 50% of entries. Wouldn’t back up info to new iPhone from an iPhone. Would not back up in any software or platform. Used Drive, icloud, Pages and others. It doesn’t seem to separate multiple phone numbers when on same line and tends to double send contacts to address book by default...if you don’t filter new scanned cards first, before telling to send to iPhone address book, that needs improvement. This morning I was not able to resend password for online card syncing and no real help Link is in app! It never sent resent link but said email was valid so I don’t know what’s up. It takes longer to correct the scan than just entering everything manually! Works OK, not great but ok. 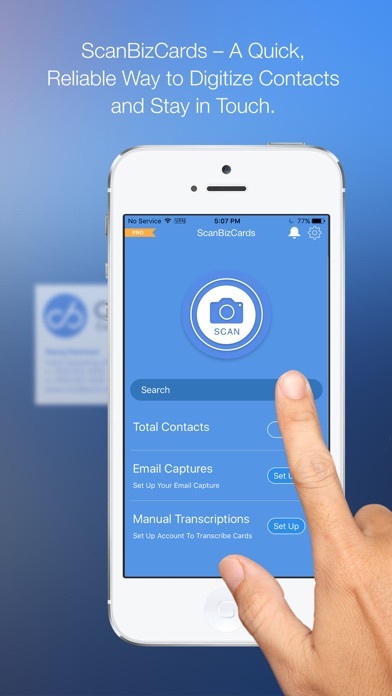 This app scans cards properly less than 1/2 the time, which means the user has to spend valuable time proofreading every scan to be sure everything is correct. It doesn’t translate phone numbers or email address very well at all. Also, it commingles business contacts with personal contacts, which is very cumbersome. The free app CamCard works way better. The info on this app hasn’t transferred accurate info once. Bought this for the Salesforce integration will transfer contacts but doesn’t link to accounts. One out of twelve correctly scanned. After many tries, and all but one correct of twelve different cards scans, I am sad to say I can no longer attempt to use this app. The only correct scan is a plain white business card with a very minimum. Name, address, phone. It takes longer to correct the mistakes than to just add the contact manually in my contact list. I watched someone scan the exact same cards successfully on a Galaxy Note 8 Android phone with it’s native camera app. I have an iPhone X... paid $2.99 for this app. I wrote the developer. He suggested I had the business card upside down, too low of lighting, improper crop, etc. I will ask for a refund. Don’t waste your time or money on this app. Bought it, tried it, cancelled it. Wasted $2.99 on an app I will never use. There are other apps out available that do a much better job. For instance, the app I did download and now use simply scans the card, accurately enters the information and crops all in one simple scan. Buyer beware. I like the app. It’s saves me a lot of time but it has few glitches. Sometimes there are typos in the data captured. Time saver, I am much more likely to enter cards to my contacts. Works very well with an iPhone. I couldn’t get it to work with my previous Android phones 2-3 years ago but maybe the better ones now would work. No iPhone X version. All features are outdated. No support at all after you buy it. I scanned 3 cards when I got the app, and there were major mistakes in at least 3 fields for each card I scanned - misspelled email addresses, names, urls. I spent almost as much time fixing the mistakes as I would have just entering them completely by hand. That also created a lot of extra anxiety and distrust of the app - how could I have any confidence that the info for my scanned contacts would be correct. Waste of money and time. App freeze can’t CVS file to self. I thought this was a pretty cool out until I had to download CVS file from business cards lost to self. Will not allow the app to send off email of CVS file. I’ve only done 10 cards or so but none have come through without errors so far. It does a decent job of reading the card but many times could not understand the company’s name because the name was in the logo and not just basic font type. In less it’s hidden in a setting somewhere it won’t allow you to add the new card to a specific folder. You have to go in and manually and change the folder after adding a new card. A great feature would be to open a folder and add a new card from within that folder so it goes directly to that folder. I will look for an app with features and options that better suite what I would like. It only scans half of the information such as the names and phone numbers. This is the worst app I’ve ever paid for. So I opened this app to scan a business card only to be greeted by full page explanation of the app's new version....not necessary. However, hidden at the bottom were two options: "Download App" and "Remind Me Later". I chose the later three times, yet all three times the app forced me to the App Store. I decided, AFTER THE THIRD TRY, that I didn't need an app that tried to force me to download something that I do not want. I deleted the app. Thing can’t read a simple phone number in black and white from a clear photograph. Don’t bother with this one. This is a great time saving app for adding new contacts to your Outlook contacts list. Quick scan and edit when needed and you can add it to your address book with one click. The reader is very accurate for all but the busiest cads. I highly recommend it. This is a great little app for maintaining and keeping your cards organized exportable information goes to your address book relatively easily, edit it from there and extremely useful tool! One after I buy the Pro version, WebSync disappears!! How can I share contacts between devices? Nothing seems to be work. Sometimes getting a picture perfect is hard and messes up the fonts to save. Sometimes the info is jumbled. But over all the app is the best app. I could not live without it. Love the idea but the OCR is miserable. Of my first two cards scanned, it got the email wrong in one, and for the other got no email and got phone wrong. I use this after every trade show and meeting I have where I collect biz cards. It makes short work of getting biz cards into our SugarCRM. I had a problem with the upload, and the helpdesk got it solved in no time flat. Worthless. Don’t waste your time. There’s no way to transfer the data to your CRM unless you use one of the big ones like Salesforce. I use a more affordable one, so there’s no way to transfer. This app used to offer web sync & transfer to csv (excel), but they discontinued both those features with no notice. So now I have no way to transfer hundreds of cards, unless I want to manually transcribe them all. I stopped looking for a business card scanner after I got this app. Works well on business cards. I like that it suggests company names for contacts that are similar. I even use it to scan signature lines on emails off my monitor screen. Needs occasional editing. Overall very accurate. I’m very satisfied. Highly recommend. This app was so much better before it was updated. It allowed you to add a follow up on my schedule but now that feature is gone. Which means that this is only a camera shot of my biz cards that I can take with my camera. This app would be far more useful it the scheduling feature was restored. I love the app and the concept. Huge time saver. That is, if it would only capture the information actually. I would say 0% of the cards scans have loaded without mistakes. It is still often faster to correct a few problems then enter 100% of the info from scratch but if you are not careful it almost always has an error or two, or 3. There has been a couple that if not corrected and saved that would have caused either a problem or worse. Again, great app and great concept. I hope they continue to improve and send me updates. If it helps to know, I am using an IPhone 6S-P so the camera is good and not the issue. The scanning function won't work properly unless the card is perfectly lined up (there's no deskew functionality at all). There is no support at all for vertical business cards. The OCR function is pretty hit or miss, and it's tedious to edit anything (good luck typing in phone numbers in a legible way when you can't put parentheses around area codes or insert dashes between the local exchange and the number, or type "ext." for an extension). The "rescan" button is a lie. It shows an animation and (presumably?) re-OCRs the image. If you want to rescan the card you have to hit "Retake" which is another button entirely. Endless popups. Screw you. I want my money back. The app lists the option, yet the process NEVER works. Fix it , or I’m gone. Only entered one card; however, every field needed to be manually reentered Waste of money. Export to Email Does NOT work! I reached out to support but they were not helpful at all. Export to email does NOT work!!! Great app!!! Especially the Websync feature. It’s 2018 this is perfect! Great way to store all of your business cards in one place, never lose a card again! I love this app! I just downloaded it and it failed in the first five minutes. Now seems we working OK but stay tuned. By the time I was done with corrections faster to just enter myself. Super disappointed - lacks any level of accuracy. What a disappointment - so bad that it’s actually one of the first app reviews I felt completed to write. Honestly believe that all the 5 star reviews are fake! I paid for the PRO version and what a mistake that was. The one thing the app has to do is accurately scan in business cards and it fails miserably at this - the OCR is erratic, faulty and inconsistent making different mistakes on the same business cards. Please do not waste your money on this! I’m impressed at how well this works. Love it and easy to use. Had zero problems. There has to be a lot of manual intervention in order to get the card cropped properly and spelling, URLs, phone numbers etc. inputed properly. Please provide me with an email so that we can correspond with one another. We have an employee who purchased this app and now is unable to export her contacts into our CRM, but not even into a simple spreadsheet. This needs to be fixed as soon as possible as she, along with the rest of our company, has leads they need to enter into our CRM, but they are trapped inside the ScanBizCards app! I would rate the app a five, however I have a persistent problem. With how it behaves when integrating contacts with my iPhone. Whenever I add a Contact to my iPhone the button to return to the app is frequently unresponsive, it’s stuck inside the IPhone address book. It’s ok but you have to edit each card! Never gets it completely correct. The Evernote ap is much better but no way to upload to constant contact. In comparison to other apps I found this to not be accurate and find myself typing the info all over again. Waste of money. I scanned the first business card and it did not recognize a single digit or letter, promoted me to manually transcribe it and deducted 1 out if 2 credit; 1 out if 2 credit for permitting me to type the business card info as indexable information for a photo. Something I could do for free in iOS Contacts. Scanned a 2nd card and prompted me with a pop-up that the app will transcribe it in 1 or 2 business days. Took a screen shot but can not attach it to this review. Very disappointed - a total waste of $2.99. Asked for refund - no replies! Apps should be up front about the hidden costs. This is getting silly and frighteningly normal for apps to grab your contacts and next step to ask you for additional money. Why do I need to sign up just to scan info from card to address book? I’ve read your privacy rights and if I signup for an account, you can use the info for anything. This also gives you total access to all my contact and not the one I just scan with app. This was a great product until I needed an account to sign in. Now you want all my contacts now. I just want to use your app to add to my contacts list. I can’t do anything with app unless I create an account. Useless App! I bought this app and feel like I got ripped off. It hasn’t been updated for iPhone X and also has no export feature. So should this app, which appears to be abandonware, ever stop working all your contacts and data is lost. It does not transcribe as it should. My friend used the same app and it did work. Go figure! When reading business cards this is solid. Some flaws in ocr but correctable. Tried email “signature analysis” trashed my contacts that I already had and merge failed miserably. Turned it off. When you scan a card, there are frequent errors for the phone number and email address, which in my opinion is the most important to get correct. If it doesn’t do that reliably, then it’s useless, which this app is. Promises free “websync” but as soon as app is loaded a new survey basically asks how much you’d pay per year for the “free” websync, as they can’t afford to run it anymore. Hate deceptive advertising. This app is garbage. 90% of the time you will have to make corrections to the OCR's transcription. Brilliant product! Well designed, simple to use and saves a lot of time!! I scanned many reviews and websites looking for a biz card app. This one came up as the “most accurate” scanning technology. I’d beg to differ. I’ve scanned five cards already and had to edit something on ever single entry. Not sure the use of this app. Works really well with minimal editing needed. This app does what i need it to do. Also can port contacts to other contact books. Why have you not uploaded this app?!? Has to be the best and easiest way to keep up with contacts that are important to you! No longer have to keep up with cards, just scan and boom it’s in address book and you have a pic of the card whenever you need it. Plus the ability to send any card to someone via text or email!! Absolutely can’t live without it! I realized when I tried to take a pic of a business card it didn't readily snap the photo and crop just the card. My bank's check reader does this why not a business card reader. Secondly, these are business cards why when it appears as a contact (not yet input to your personal contact list) highlight/bold the name of the business instead of the person. I deal with multiple people from the same business. It would be helpful to list all people associated with a business instead of having to search for someone. The paid version says it works with Salesforce. In fact it is limited to 7 imports to Salesforce. They try to get you to upgrade to an Enterprise version to be able to continue using Salesforce with the App. You can just take photos of your cards instead of using this app. After 7 cards you’ll have to type the info into your CRM anyway. I love this app! It lets me get all the info in my contacts and I am free from all the business cards I have in piles at home and work!!! 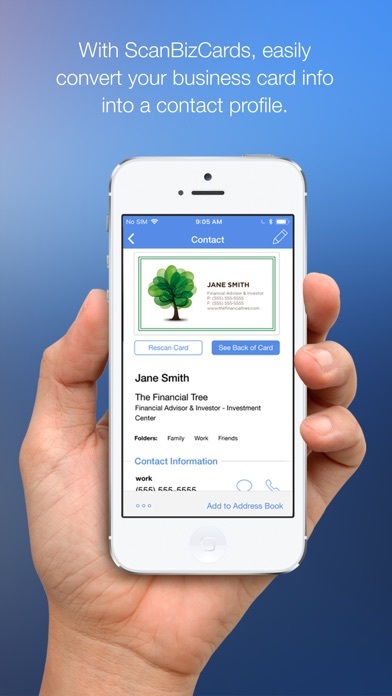 Great app for keeping track of your business cards amazing how it organizes the information. Recommend to all my friends. I love this app because it scans the card and does a good job of translating most of the time. Not only do I not need to spend time organizing my business cards and trying to remember why I kept them, but it also allows me to bring them with me wherever I go. I can’t tell you how many times I wanted to tell a friend or colleague about a contact, but had to get back to them, because my card case was at home. Also, it allows you to add notes, so you can remember why you felt the importance of keeping a particular card and this has become a useful tool for personal contacts just as it is for business contacts. Went to an important dinner recently and they were three different people whose names I could not remember. I knew which company they work for and so I pulled out my handy-dandy phone and got their names in a minute. Easy to use. Mostly get content corrected. Allow easy export to phone contacts. 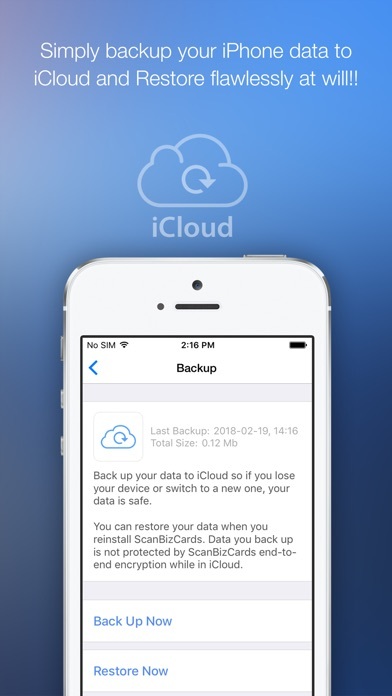 Back up available for icloud and Google drive......awesome for cross platform use. Would get 5 start if you could send a card to airprint printer. Makes it easy to share. Would also be great to text vcards via imessages. I've found that I have much more success with this app getting accurate data read from the scans! Cards do not load accurately, so you spend a great deal of time correcting. Not worth the time, find a different App. after attending a conference i dowloaded this app to speed up getting new contacts into my Mac/iCloud contacts. worked great. intuitive UI. this app is much less exoensive yhan most others i consided. most require monthly subscription which i would never consider. i only need an app like this 2 or 3 times a year when i attend a large conference. i timed my work. took, on average, 24 seconds per card. much better than i could do by hand and with fewer errors. app struggles at times with poorly designed cards with disorganized info or lack of color contrast. I paid for this app and then after uploading 8 business cards to Salesforce they wanted me to upgrade. What is that about? I had some business cards that I wanted to throw away but didn’t want to lose the contact info so I downloaded this app. 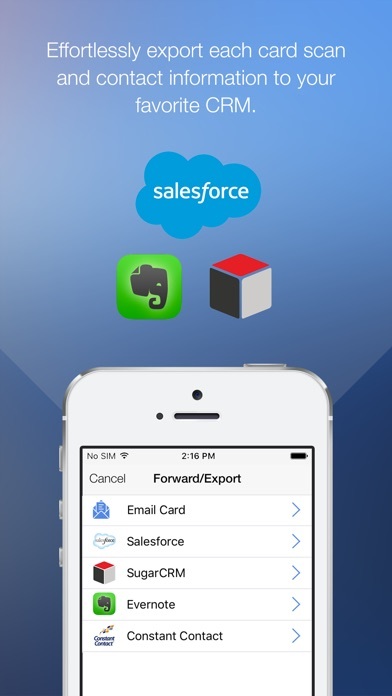 I like the idea of keeping all the business cards I have in one app and if I want I can export it into my contacts. The problem is I scanned 3 different business cards and all 3 I had to edit. It would put the name of the person into the wrong field. Had the address wrong in the one and had the phone number wrong in the other. If you could get it to scan all the correct info into the correct fields it would be perfect. I’m going to keep the app because I like the way it organizes it. I just didn’t want to edit every business card, but oh well. I really like this app. As a retired business man I would of really used it back in the day. We travel frequently and pick up cards from businesses and people we meet. I like the ability to make folders that allow me to quickly find a card related to where/why I have it. Keeping these folders separate from my contacts is exactly what I need. I recommend this app to everyone. The scanning is great and very effective. I started with the Free Edition and became familiar with the uses and quickly decided to upgrade to Pro Edition. I needed a little help to transfer cards from free to Pro Edition. I contacted Customer Service and received immediate response and follow up. Great App Company. An absolute MUST for any business executive and/or Adman! We were looking to purchase for our business and to deploy 23+ sales people in our organization. However, upon trying it out on two separate iPhones (version six & version seven on iOS 11.2.2) but the app crashes when we attempt to export into sugar CRM. If this can be fixed, we may purchase. I often find errors in the transcription of a business card and have to fat finger in the right information. The app is stable but the interface and screens are dated and clunky.